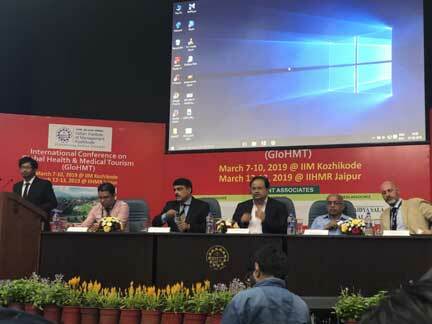 Kozhikode: IIM Kozhikode in collaboration with Indian Institute of Health Management Research (IIHMR) Jaipur, today, completed day three of International Conference on Global Health and Medical Tourism (GloHMT). GloHMT conference Chair, Prof. Deepa Sethi along with Prof. Federico Lega, SDA Bocconi School of Management, University of Milan, Italy and Prof. Robin Nunkoo, Associate Professor, University of Mauritius announced GloHMT 4.0 in 2020 at Mauritius which will be conducted by International Centre for Sustainable Tourism & Hospitality, University of Mauritius and Research Centre in Health Administration of the University of Milan. The event commenced on 7th March 2019 with a plenary keynote address by Prof. Jagdish Sheth, Charles H. Kellstadt Professor of Marketing, Emory University Goizueta Business School and Prof. Dr. Angappa Gunasekaran, Dean and Professor, The School of Business & Public Administration, California State University. Prof. Sheth, in his keynote address, highlighted India is destined to become a global destination for medical tourism whereas Prof. Dr. Gunasekaran enlightened the participants about systematic perspective on the applications of big data analytics in healthcare management. The event then witnessed an inaugural ceremony where all the industry veterans were introduced to the crowd. This was followed by a heartwarming welcome speech by Prof. Debashis Chatterjee, Director, IIM Kozhikode and Prof. Deepa Sethi, Chair, GloHMT, IIMK. The inaugural ceremony also comprised of speeches by Prof. A B Unnithan, Dean, Academic Affairs & Development, IIM Kozhikode. An address was also made by the guest of honours, Padma Shri Dr. M R Rajagopal, Founder Chairman, Pallium India where he spoke about the importance of palliative care and Dr. Nasser Yusuf, Cardiothoracic Surgeon, Vijayshree Award Winner. The second day of the event took off with a visit to the business museum of IIM Kozhikode and was followed by a heartfulness session by Mr. Kamlesh D. Patel, Spiritual Leader popularly known as Daaji, World Teacher of Heartfulness. After a traditional Onam Sadhya meal, plenary addresses were given by some of the renowned personalities of health and wellness sector. Prof. Federico Lega, SDA Bocconi School of Management, University of Milan, Italy, spoke about capacity and leadership development in healthcare and medical tourism. He suggested glocal alliances to provide healthcare solutions with the help of disruptive technologies which can be accessible to all. He also highlighted various facts about the medical tourism industry worldwide and how one can gain competitive edge in the space. He emphasized on new strategic postures like hub and spoke model for medical accessibility worldwide. Other stalwarts such as Dr. Narayankutty Warrier, Medical Director & Sr. Consultant Medical Oncology, MVR Cancer Centre and Research Institute, Kozhikode along with Dr. T. Sreekumar, Vice-Principal & Professor, Vaidyaratnam Ayurveda College, Ollur, Thrissur addressed the audience. Kerala Tourism, MVR Cancer Research Centre, and Arya Vaidyashala, Kottakkal associated with the conference along with exhibitors like: Vaidyaratnam and Mathrubhumi Books. The conference was interactive and research driven to provide the best in class healthcare practices. The third day of the conference started off with various research paper presentations that covered wide range of topics in the healthcare and medical sector. Papers were presented by Prof. Shilpa Arora on Effective doctor-patient Communication. Prof. Debashis Chaterjee along with Prof. Deepa Sethi and Prof. Vikas Arya also presented papers on the topic titled ‘Turn that frown upside down” A contextual account of non-verbal communication to build patient’s allegiance and their credibility towards doctors’. Others topics such as enablers of patient Safety Performance in health care Institutions were also presented at the event. The event witnessed plenary address by Prof. Robin Nunkoo, Faculty of Law & Management, University of Mauritius where he spoke about several factors related to the demand and supply dynamics in medical tourism. He also talked about the topic of quality healthcare in potential countries and how can the government as well as the private sector players take proactive steps to promote the country as a preferred medical destination. The conference was further enriched by Dr. Tanuja Nesari, Director, All India Institute of Ayurveda, Ministry of Ayush, New Delhi, who attended the event and also enlightened the audience through her plenary address on the potential and opportunities for Ayurveda. Dr. Nesari spoke about various aspects of medical tourism such as wellness and cure; she also highlighted different growth enablers in the space along with numerous investment opportunities available. The conference concluded with a valedictory ceremony where the guest of honours, Mr. Sreeram Sambasiva, IAS, District Collector, Kozhikode and Dr. Sheila Balakrishnan, Professor, Head, Fertility Centre, Trivandrum Medical College, Trivandrum graced the event with their presence. Mr. Sambasiva spoke about the importance of medical tourism and how institutes like IIM Kozhikode can contribute in the wide spread awareness of the concept at a national level.